India’s “Link West” policy has seen both continuity and change. The geopolitical dynamics of the Middle East have been changing in an unprecedented manner over the past few years. These changes pose multiple challenges for India with respect to New Delhi’s agenda for a stronger cooperation with the Middle East under the ambit of the Modi government’s “Link West” policy. Some of the changes in the Middle East brought countries closer to India, reciprocating the Link West policy, but fluctuating regional stability has been a concern for New Delhi. For both military and civilian purposes, India is energy hungry. In 2013 India had already become the third largest energy consumer in the world. Such a condition has always directed India to the Middle East, which is both geographically close and strategically important. As per a report by Indiaspend, more than 63 percent of India’s oil imports are from the oil rich powers of the region, and the Middle East is also home to more than 7 million Indians. Considering these factors, a strong India-Gulf Cooperation Council (GCC) relationship has been mooted by several scholars considering India’s rising economic interests and India’s aspirations to exert its influence beyond the Indian Ocean. The fact that, amid all the regional tensions, Indian migrants in the GCC countries alone generated remittances worth $40 billion in 2018 highlights the need for India to stabilize its interests in the region. One of the most important pillars for India’s great power aspiration is widened strategic influence. New Delhi has to increase the bandwidth of its foreign policy and find more areas of mutual interest and strategic convergence in the Middle East without disrupting the balance it has created in the region in terms of both bilateral and multilateral engagements. So far India has been engaging with Saudi Arabia, Iran, and Israel simultaneously without making any political comments that could affect any bilateral engagements. The Middle East region has seen a series of important changes in the last decade. The rise of Saudi Crown Prince Mohammed Bin Salman and his Vision 2030 plan has gained much momentum in an attempt to diversify the Saudi economy, improve its education and health sectors, and develop the overall infrastructure. The plan also seeks to improve the overall image of the conservative kingdom to an outward-looking, prosperous, and growing regional power. Yet amid the efforts of the Prince, the murder of Saudi journalist Jammal Khashoggi and the Saudi-led war in Yemen have received a lot of flak from the international community. The unprecedented turn of events in the region raised concerns for India. The Indian government refrained from offering aid to any military or political coalition amid the conflict. As the crisis escalated, the government carried out an evacuation operation in Yemen named Operation Rahat in 2015. India began evacuating and rescuing hundreds of citizens on April 2, 2015 with the help of a commercial liner docked in the port of Aden. These citizens were evacuated from Sana’a to Djibouti and from there more than 4,600 Indian citizens and more than 900 foreign nationals were rescued. Another major turnover of events in the region was the Qatar crisis, which erupted when nine countries including Saudi Arabia, the UAE, and Bahrain cut off all kinds of diplomatic ties with Qatar. The crisis has its genesis in Qatar’s link to Ismalist political parties like the Muslim Brotherhood in Egypt, which the Saudi government calls a terrorist group. Saudi Arabia also had problems with the way Qatar engaged Iran and has been signaling Saudi distress over that relationship for a long time. India responded to the Qatar situation by stating it was an “internal matter of GCC,” as External Affairs Minister Sushma Swaraj put it in a tweet. The Ministry response also focused on its efforts to enable smooth and uninterrupted travel for the Indian diaspora in the country, which included the initiation of additional flights services and subsequently an Indian-Qatar express service for the shipment of food products and other essentials from India. Deepening engagement with Saudi Arabia and the UAE could be noted as a galvanizing point for India’s Link West policy. The decision of ADNOC (Abu Dhabi National Oil Company) and Saudi Aramco to jointly invest $44 billion in a refinery in India was a major leap forward. Aramco signed the agreement to develop nearly 1.2 million barrels per day in the Ratnagiri refining and chemicals complex. India’s engagement with the UAE has also moved to other areas like defense and strategic partnerships. In May 2016, Manohar Parikkar became the first Indian defense minister to visit the UAE. Experts pointed out a new momentum in the relationship between the countries after the inking of a Comprehensive Strategic Partnership. Under this, the two sides have forged a strong strategic partnership while highlighting counterterrorism cooperation and defense partnerships. 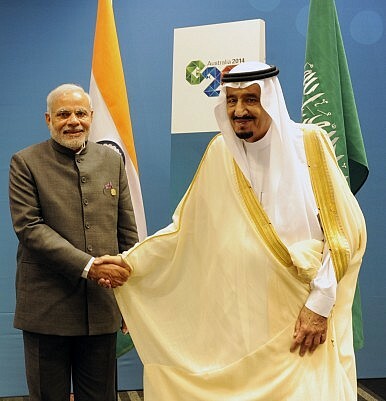 India’s elevating strategic partnership with Saudi Arabia affirms New Delhi’s priorities in the region. In July 2018 when Indian Prime Minister Narendra Modi visited Riyadh and met King Salman bin Abdulaziz al Saud, it was reported that the two leaders engaged in talks that lasted for more than two hours. Five key agreements were signed that addressed issues ranging from anti-money laundering to drug trafficking. Both the countries also agreed on the need to strengthen bilateral defense cooperation primarily through the exchange of visits by experts and military officials and suggested conducting joint military exercises and supplying arms and ammunition. The fact that India has been one of the world’s fastest growing economies since the 2000s helped New Delhi get leverage in dealing with Saudi Arabia, Iran, and Israel simultaneously without being criticized by any countries. Countries like Iran and Saudi Arabia have slid their regional agendas under the carpet while dealing with India since they ascertain that Asian markets like China, Japan, South Korea, and India are going to be their premier customers in the coming years. India is also investing in large natural gas fields and is developing the Chabahar port in Iran, which is expected to be a major turning point in the Iran-India trade relationship and a strategic counterbalance to the Chinese-run Gwadar port in Pakistan. Maintaining a close relationship with the Sunni monarchs of the Arab world without disrupting the relationship with Iran, and refraining from getting politically involved in any conflict in the region, could be seen as continuity in terms of India’s engagement with the Middle East. However, there have also been major changes in the form of deepening strategic partnerships and accelerated economic and trade ties with the UAE and Saudi Arabia in recent years. The engagement with Israel and the mutual visits by Modi and Israel’s Prime Minister Benjamin Netanyahu also can be seen as changes in India’s Middle East policy. The much hackneyed “balancing” policy of New Delhi in the region has so far made sure that India sets its priorities to ensure energy security and accelerate economic ties in the region. Nevertheless, the sectarian-based conflicts and the proxy wars that constantly weaken the Middle East’s security and stability make it extremely complex for India to stabilize its interests in the region, much less venture into new domains of engagements. Nadeem Ahmed Moonakal is a former research intern at Centre for Arab-West Understanding, Cairo and a post graduate research scholar at the Department of Geopolitics and International Relations, Manipal Academy of Higher Education, Manipal, India. A New Reality Confronts India in the Middle EastBridging the Gulf: Securing India’s Migrant Workers in the Middle EastIndia at the OIC: Has ‘History Been Made’?India and Saudi Arabia Move Beyond EnergyWhat Will Pakistan-Saudi Arabia Ties Look Like Under Imran Khan?